Denver Public Schools’ Evie Garrett Dennis Campus is a testament to the power of innovation, environmental responsibility and community support. The first facility in Denver Public Schools to attain Gold certification from the U.S. Green Building Council’s LEED® for Schools Rating System, it is one of the most efficient school facilities in the State of Colorado. Contributing to this achievement, the E-12 campus features Tubelite Inc.‘s entrance systems manufactured with recycled aluminum and eco-friendly finishes. Located in the rapidly growing Green Valley Ranch area of northeast Denver, the campus will serve 1,700 students in three separate schools when complete. 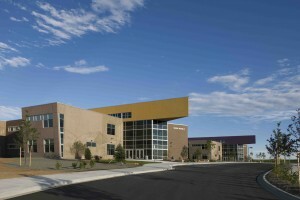 SOAR K-5 charter elementary school and a second campus of the Denver School of Science & Technology 6-12 charter school opened in September 2010. A third school, Vista Academy, is expected to open in Fall 2011. The campus is named after retired Denver Public Schools (DPS) Superintendent Dr. Evie Garrett Dennis, Denver’s first African-American superintendent. The 35-acre campus hosts four separate buildings totaling 190,000 square feet. Intentionally designed to resemble a small college campus, the grounds include shared space in a new student union and new regional sports complex. The project’s design goals were created through a collaborative group process comprised of members of the Green Valley River community and led by project architects DLR Group. Energy efficiency and environmental sustainability were important elements of the Evie Dennis campus‘ $43 million design. Two of the four buildings are classified as net zero-energy facilities. Aiding in this, the complex includes some of the newest technologies that reduce the need for energy and other natural resources. Contributing to the campus’ sustainability goals and aesthetic appeal are entrance systems from Tubelite. Manufactured using EcoLuminum™, Tubelite’s high recycled-content aluminum billet composition featuring environmentally-friendly finishes. Tubelite formulated EcoLuminum’s standard billet composition to contain a minimum of 80% reclaimed aluminum. EcoLuminum’s recycled billet consumes 95% less energy to produce than that of standard, non-recycled billet. In addition, Tubelite products using an eco-friendly anodize finish send 90% less waste to landfills than traditional anodizing. Painted finishes also can be specified, applied and controlled in an environmentally-effective manner to minimize, or even eliminate, volatile organic compounds (VOCs). These architectural-grade finishes, applied by Linetec, help minimize maintenance and further protect the entrance systems’ rigorous operation. Engineered to withstand heavy use in schools, public buildings and other high-traffic areas, Tubelite’s T14000 Storefront and Monumental Wide Stile doors were selected by general contractor Saunders Construction and installed by glazing contractor Metropolitan Glass. The doors’ durable tie-rod construction, five-inch-wide stiles, up to 10-inch-high bottom rails, and heavy-duty hardware meet the school’s performance requirements. The entrance systems’ sightlines complement the overall, architectural balance. 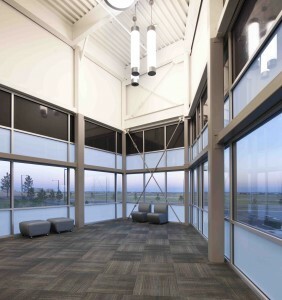 DLR Group’s design also incorporated extensive daylighting as a key strategy to lower utility costs. Wausau Window and Wall Systems® fixed and projected 2250 Series windows were specified to assist with maximizing natural light, outdoor views, natural ventilation and thermal performance. Additional sustainability features within the complex include geothermal heating and cooling, solar power, water conservation, materials with recycled content, enhanced indoor air quality, and optimized operational and maintenance practices. Technology was also an important component of the Evie Dennis campus. Each classroom offers an interactive whiteboard, touch-screen TVs are scattered throughout the four main buildings, and computer network and Wi-Fi capabilities encourage campus-wide connectivity. The campus was funded through a $454 million bond, the largest school construction bond in Colorado history. The project was completed ahead of schedule and approximately $6 million under budget, allowing Denver Public Schools to add another school building to the two schools originally planned. Planning for the complex was done in partnership with Denver-based homebuilder Oakwood Homes and the Foundation for Educational Excellence. Evie Garrett Dennis Campus, 4800 Telluride Street, Denver, Colo.
* Architect: DLR Group; Denver, Colo.
* Contractor: Saunders Construction; Centennial, Colo.
* Entrance systems – manufacturer: Tubelite Inc.; Walker, Mich.
* Entrance systems – finisher: Linetec; Wausau, Wis.
For a high-resolution images, please see http://heatherwestpr.com/webimages/Tubelite_DenverPubSchools1.jpg, http://heatherwestpr.com/webimages/Tubelite_DenverPubSchools2.jpg.